Home > News > It’s Not About The Savings, Is It? It’s Not About The Savings, Is It? Revival of energy efficiency drives? With the Government’s apparent, even if temporary, indifference to reducing carbon emissions; its cancelling various home standards and efficiency schemes; and the effective withdrawal of incentives aimed at renewables; you’d be forgiven for thinking that the energy efficiency debate was in abeyance for the foreseeable future. Not so, it seems: as reported by sustainability website Business Green, think tank Policy Connect recently published a series of recommendations to underwrite the future of the sector. Business Green itself highlights seven of the ideas “which could turn things around for a sector which promises to deliver cost-effective emissions reductions and tackle fuel poverty, but has faced numerous policy setbacks in recent months” (http://www.businessgreen.com/bg/analysis/2456346/seven-ideas-to-save-uks-faltering-energy-efficiency-drive). One relates to the Energy Efficiency (Private Rented Property) (England and Wales) Regulations 2015, as recently discussed by ourselves here: https://www.eurocell.co.uk/news/no-rating-no-rent-the-impact-of-epcs-on-rented-properties). As Business Green puts it: “While current minimum standards say that by 2018 all eligible private rented properties need to be an EPC E rating or above, the (Policy Connect) report argues a longer term policy of incremental increases in the minimum efficiency standards should be set out. Such standards should be announced clearly in advance, driving further improvements but also giving property owners the chance to plan well before they come into place. This kind of long term thinking would also encourage homeowners and landlords to adopt what is termed a ‘whole house’ approach – where comprehensive upgrades are made with a long term view and the understanding that ultimately the house will have to meet very high energy efficiency standards, saving costs in the long run”. Hard to argue with that. 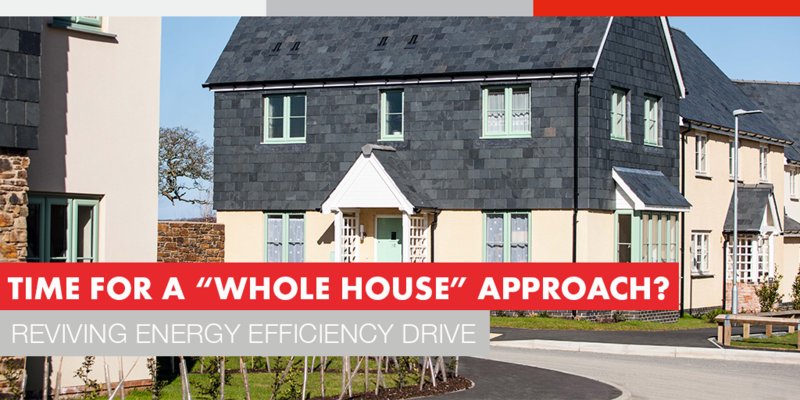 Perhaps more pertinently to the home improvement and domestic construction sector is the suggestion that the emphasis on financial savings when it comes to domestic energy efficiency policy should shift to a more ‘value added’ perspective. We’ve been saying this for some time. While, obviously, reductions in homeowners’ energy bills are welcome, as is the potential pay-back in the property investment through them; new narratives are needed to maintain and increase uptake of home improvement measures. Business Green identifies these as homes being warmer, more comfortable and more valuable. In a nutshell, this is spot on – and we’d venture there’s more to recommend them that: adapting homes to lifestyle and generational changes; improving property aesthetics; adding colour and personalisation to properties – so becoming more vested in our homes – and overall ambience. One new/ old consideration (old in that it’s been around for ages, new in terms of prominence) is sound attenuation. With the pressure on land for housebuilding, it’s patent that there’s more development adjacent to problematic locations such as major roads and railway lines. Noise reduction is a great unsung benefit of double-glazing and expect to hear more from us on the subject soon.